Okay, who's missed Anna Campbell? Me too! Oh, I know she's been busy writing (totally okay with that), traveling (I always enjoy her photos), and baking (sure wish I lived closer) but I still expect to see her name on the 24th of each month when I look at the Dish calendar. Is it any wonder that I'm over-the-moon excited to welcome her back today? Always a voracious reader, Anna Campbell decided when she was a child that she wanted to be a writer. Once she discovered the wonderful world of romance novels, she knew exactly what she wanted to write. Anna has won numerous awards for her historical romances, including the RT Book Reviews Reviewers' Choice, the Booksellers' Best, the Golden Quill (three times), the Heart of Excellence, the Aspen Gold (twice), and the Australian Romance Readers Association's most popular historical romance (five times). 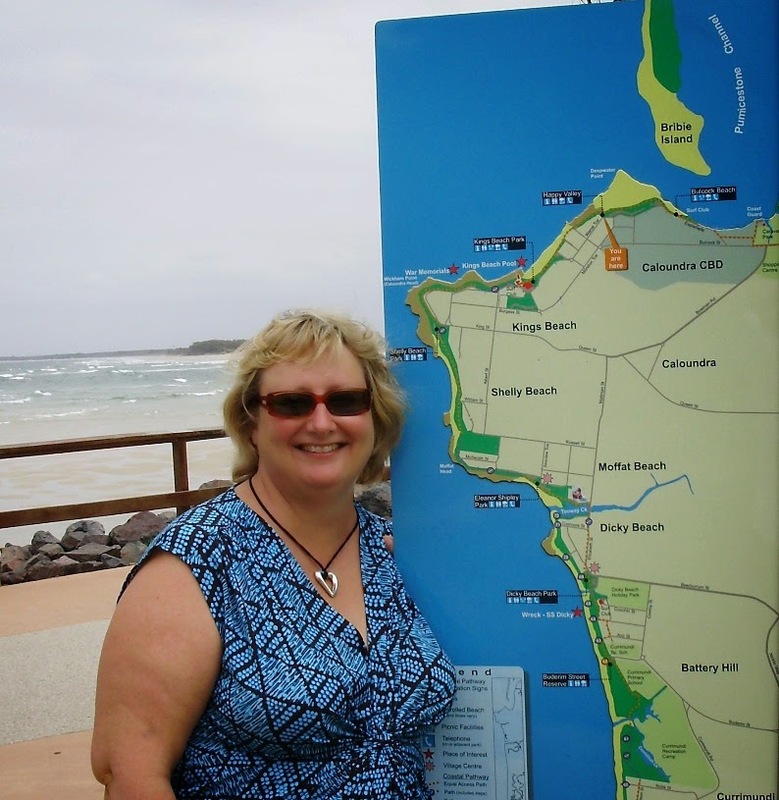 Her books have twice been nominated for Romance Writers of America's prestigious RITA Award and three times for Romance Writers of Australia's Romantic Book of the Year. When she's not writing passionate, intense stories featuring gorgeous Regency heroes and the women who are their destiny, Anna loves to travel, especially in the United Kingdom, and listen to all kinds of music. She lives near the sea on the east coast of Australia, where she's losing her battle with an overgrown subtropical garden. Hi PJ and Andrea! Lovely to be back here. I’ve missed treading the halls of Dish Central. It's wonderful to welcome you back, Anna! We sure have missed you around here. What have you been up to since taking a hiatus from your many blogging endeavors? I’ve actually had a mixed few months. On the downside, I fell over and did something awful to my left arm so I’ve been on the sick list for nine months and counting (it’s much better now, I’m pleased to report). Also I put my house on the market and it didn’t sell. On the upside, I put my house on the market and it didn’t sell (turned out I’m really glad to stay after all that!). Writing-wise, I’ve been preparing for Scoundrel’s release and writing some indie novellas. Brace yourselves for a flood of new releases in the second half of the year (well, three!). So happy to hear your arm is improving. And big cheers for the three new novellas! A new story from you is always cause for celebration. I’m sure that I speak for all of our readers when I say I’m very excited for the release of A SCOUNDREL BY MOONLIGHT. What should readers expect from this newest book in your Sons of Sin series? How lovely that you’re excited about the book, PJ. I just loved writing those characters – Nell and James are completely wrong for each other, except that they’re so completely right for each other. Love that dynamic. I got to play with mistaken identities and revenge and love across the class divide with this one. Not to mention a very strong Cinderella trope! There’s lots of sexual tension and snarky dialogue, both of which were fun to write. And I had huge fun with the moment when the immovable object gives in to the irresistible force. 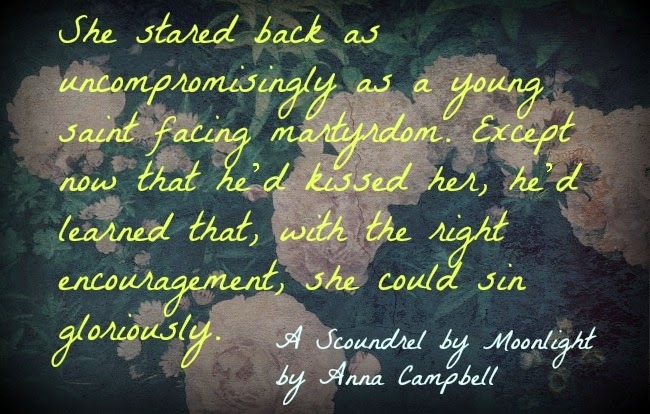 A SCOUNDREL BY MOONLIGHT includes two of my favorite romance themes, mistaken identity (as you mentioned above) and enemies to lovers though in this case, our heroine is the only one who knows they’re enemies. Our hero is mostly bewitched, bothered and bewildered, as the song goes. How do these themes inspire you as a writer? It’s interesting quite how often mistaken identities appear in my books. Or at least questions of identity. In fact, there’s some mystery of identity in everything I’ve ever written – and I had no idea until it was pointed out to me that was the case! It’s at least partly to do with the fact that most of us present some kind of persona to the world, but when we fall in love, we can only claim that love if we reveal our true essence to the other person. And of course, that’s absolutely terrifying! By the end of the book, both Nell and James have discovered that they aren’t quite the people they always thought they were – and they’re better for it. I love your description of James being B, B and B. That was exactly how I thought of him – he doesn’t want this overwhelming attraction, poor boy, but he’s stuck with it. As a reader/filmgoer, I’ve always loved the enemies into lovers trope. So much at stake and every reason not to fall in love, but as gradual understanding builds, falling in love becomes inevitable. I also look forward to that moment when the enemies just give in to their feelings. It’s always a lovely aww scene. James Fairbrother wasn’t a very likeable guy when we met him in WHAT A DUKE DARES yet there was something about him that I found intriguing. How did he convince you to give him his own story and what do you want readers to understand about this character? Forever Romance and I both felt that the Sons of Sin series wasn’t done, although it was originally envisaged as a trilogy. Like you, I found Leath intriguing when I was writing him as Cam’s antagonist in WHAT A DUKE DARES. As you say, he’s not wholly a sympathetic character in the earlier story, although I don’t think he’s evil. What I’d like readers to understand is that we see Leath almost entirely from Cam’s point of view in Duke and Cam has good reasons for resenting him. Leath’s actions are perfectly acceptable in the Regency. Great political families like the Fairbrothers regularly made arranged marriages and in setting Sophie up with Desborough, he’s only following family tradition. Desborough, although far too old for Sophie, isn’t a bad man either – it’s a good match, especially in worldly terms. Harry Thorne, the man the young and innocent Sophie falls in love with, doesn’t look like much of a bet on paper and Leath’s attempts to keep her out of Harry’s hands stem from love and overprotectiveness. He’d be a very irresponsible guardian to trust his beloved sister to a rakish, fortune-hunting wastrel. The reader gets to see into Harry’s head and knows that he sincerely loves Sophie. Leath doesn’t have that luxury! I actually based Leath on Winston Churchill (bear with me!). Like Leath, Churchill was son and political heir to a brilliant man who died young with his promise unfulfilled. And like Leath, people were always comparing the son to the father (often unfavorably, especially in Churchill’s case). Before his death at 46, Churchill’s father Randolph was widely touted as a future prime minister. I was interested in how a background like that could form a man – both positively and negatively. Of all the women in England, Nell Trim would be one of the least likely candidates for the position of James’s wife. What was it about her that convinced you she’d be his perfect match? Ha, perhaps the fact that she’s the least likely candidate? Right from the first mention of Leath in A RAKE’S MIDNIGHT KISS, he was a man concerned with rank and status and doing the right thing and supporting the status quo. He’s also clearly a man who has a lot to learn before he’s worthy of his happily ever after. When we meet Leath, he lives for duty – and of course, marrying a housemaid is the least dutiful thing he could do! But Nell challenges and intrigues him and excites him and makes him question whether he’s living his life for himself or for the father who died too early. The covers of your Sons of Sin books have been stunning. Do you have any input into your book covers? Aren’t they gorgeous? I still think that cover for SEVEN NIGHTS IN A ROGUE’S BED is one of the most beautiful covers I’ve ever seen. Forever always ask me for ideas for the cover and for detailed descriptions of the hero and heroine – then they do their best to match my inner vision. In the case of A SCOUNDREL BY MOONLIGHT, I’d pictured Nell as a girl like Daenerys from GAME OF THRONES. There’s a lot in the book about her white blond hair and Leath has a bit of a thing about it. I’m delighted that they’ve given me exactly what I wanted there. And the cover features the first kiss scene in his bedroom which was also what I’d asked for. Let's move away from books for a bit. I’ve noticed a large number of photos of baked goods – mostly cookies - on your Facebook page lately. (You have very lucky friends!) What’s your favorite cookie to make? Do you have any newly-discovered recipes you’d like to share? Several authors have been journeying to Europe this year and their photos have me itching to pull out my passport and follow their example. Do you have any travel plans this year? If you could travel anywhere in the world, where would you go? Funny you should ask. Brace yourself for some postcards because I’m doing a UK research trip in September. Can’t wait! I think if I had endless money and time, I’d love to settle into Venice for an extended stay. There’s something magical about a city with no cars and all that water. I’ve discovered some interesting new books and authors this year. What are you reading these days? Do you have any books or authors that you’d recommend? Well, PJ, so glad you asked (and I’d be interested to see your list). I miss talking about fave books on the Dishes! I think in romance, my recommendations are Susanna Kearsley who writes time slip novels (you know, there’s some major influence of the past on the present, and often scenes set in several eras), especially her SHADOWY HORSES which I found riveting. 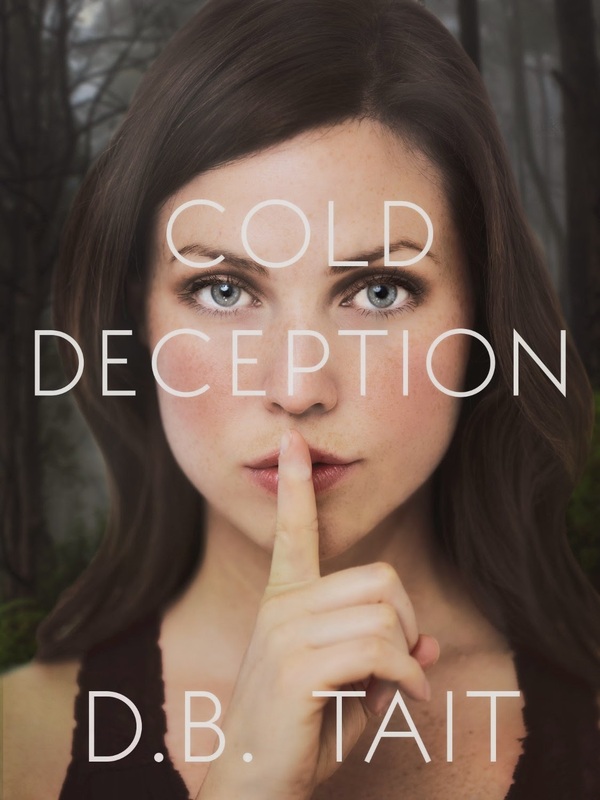 I’d also like to recommend a book that may have gone under your readers’ radar – COLD DECEPTION by D.B. Tait. It’s an Aussie romantic suspense and it’s edge-of-the-seat stuff with twists and turns that will keep you awake until after midnight. Lovely romance too. In nonfiction, I think my standouts are both by Cheryl Strayed: WILD which became the film and her collection of advice columns, TINY BEAUTIFUL THINGS. Both beautifully written and so incredibly honest, they’ll bring tears to your eyes. New books to add to my wish list! Thank you, Anna! I've missed reading your book recommendations. I’m putting out a novella around the 130-150 page mark in June. Sharp-eyed readers will notice that Marianne Seaton, Cam’s jilted squeeze, and Elias Thorne, Pen’s brother, are just begging for a story at the end of SCOUNDREL so I’m obliging with THREE PROPOSALS AND A SCANDAL. Yay! That makes me a very happy reader. Thanks so much for visiting with us today, Anna. You've really brightened up the place! Would you like to ask our readers a question? When I was a regular reviewer here, I used to love hearing recommendations from the Dish's knowledgeable readers. So tell me - what have you read lately that you've really enjoyed? Anything can happen in the moonlight . . .Justice. That's all Nell Trim wants-for her sister and for the countless other young women the Marquess of Leath has ruined with his wildly seductive ways. Now she has a bold plan to take him down . . . as long as she can resist the scoundrel's temptations herself. From the moment Nell meets James Fairbrother, the air positively sizzles. Yet for all his size and power, there's something amazingly tender in his touch. Could he really be such a depraved rogue? The only way to find out is to beat the devil at his own game . . . one tempting kiss at a time. I haven't read Vivienne Lorret yet but I've been hearing wonderful things about her writing. I guess I need to move her up my "must read" list! Joyce, she's a new name to me. Thanks for the recommendation. I'll check her out. I think all the covers of this series have been gorgeous but I especially like the colors on this one. Katrina, love, love, love Nicola Cornick's romances. She's been a favourite of mine for years. Great choice. Have you read her English Civil War Romance LORD GREVILLE'S CAPTIVE? That one's a doozy! PJ, I haven't been to bed yet - and I'm smiling! Looks like we've got 24 hour coverage! Already picked up a good recommendation in the Vivienne Lorret. Thanks for having me to visit. I was so looking forward to it - and man, you asked such interesting questions! Have A Scoundral By Moonlight on my TRL. Love the covers in this series. Such a nice surprise to see Anna here today. :) I just finished The Mermaid Garden by Santa Montefiore. A wonderful read. Thanks for the recommendation, Carol. I'll check that one out. Hope you enjoy A Scoundrel by Moonlight. I loved it! Carol, lovely to be back here. Hope you enjoy my Scoundrel. I love that title, The Mermaid Garden. I must check out the book - another new one to me. Off to check it out. Thanks, jcp! Hi, Anna! I am so glad I can still catch up with you on FB!! Congrats on the new release and the upcoming novellas!! Yay!! Thanks for popping in at TRD today!! Hi Deb! I was thinking of trying the recipe with maple syrup too. Glad to know you had success! Deb, I'm quite addicted to Facebook as you've probably guessed! I'm on Twitter and I like it but I love the way you can have a proper conversation on Facebook in a way you can't on Twitter. Horses for courses, I guess. Gingernuts are a really old classic recipe here - there's a commercial version that I always liked until I tasted the homemade ones. Actually I think the hint of maple would be great! PJ, golden syrup is a really normal grocery item here - I was shocked when I found out it wasn't in the US. The one I hear about over there that you can't get here is graham crackers. People keep telling me about smores and they sound SOOOOOOO good. I was lucky enough to read an ARC of "The Unlikely Lady" by Valerie Bowman which publishes May 5, 2015. I really loved the book and I know others will enjoy it too so, mark your calendars, Readers! I like her too, Connie! Ooh, thanks for the recommendation, Connie. Like that title! I just read a Scottish historical debut that I enjoyed a lot. It's Deception of a Highlander by Madeline Martin. I was invested in the story from beginning to end. Ooh, that sounds good, PJ. I've got that Scottish book you recommended in your best of list last year on my TBR pile - Patience Griffin? That sounded up my alley. Quilt Lady, does this one have a happy ending? Quilt Lady, I just can't take NS's endings! He has millions of fans, I'm sure he doesn't mind! Thanks for swinging by. I've been reading Mary Balogh's Huxtable series - before that read Lorraine Heath's Lost Lords of Pembrook series - wnjoyed both very much. I haven't started Balogh's series yet. Love Lorraine Heath! Oh, two absolute masters of the classic romance. Great choices, Di. I love Lorraine's cover for her new one which was out the same day as mine - The Duke and the Lady in Red. PJ, have you met Lorraine? She's absolutely lovely in person. Anna, I have met Lorraine on several occasions. You're right, she is lovely. I'll be finishing up What a Duke Dares tonight and I just loved it. Am really looking forward to hearing Leath's story. Leath's story is so very good. Hope you enjoy it, catslady! you can find golden syrup in the US, but you may hunt a little for it. I think you can order it online. I've seen it at Amazon and Walmart.com. Denise, when I was a kid, I used to love it as a spread. It's completely without nutritional value but it tastes absolutely wonderful! Roulette by Megan Mulry was very good! So was Ten Tiny Breaths by K.A. Tucker. Off to check them out. Sharlene, I'll check out both of those. I love the title of the Tucker. Really has me intrigued. It's great to see you back Anna! As for me I've been reading eARCs. One book I've been waiting for since the first book and finally glad to see is Valerie Bowman's upcoming release, The Unlikely Lady~ I so loved it! Another one is Jade Lee's upcoming release, 50 Ways to Ruin a Rake. It's very different from her usual darker and tortured stories so this change for her is absolutely delightful! It's a comical Romance! Looking forward to both of these books. Thanks for sharing, Ki Pha! Ki, lovely to be back! I've swung by a couple of times and commented on posts but as you've probably gathered from the interview, it's been an odd and fairly stressful few months. Thanks for the recommendations - you're the second one to mention Valerie's book. I clearly need to get my hot little hands on it. Love the title of Jade's book. I've read some of her contemporaries and really liked them. Be fun to read a historical. Congratulations on the release of A SCOUNDREL BY MIDNIGHT. I know it will be another satisfying read. I am glad to hear your arm is healing. It certainly didn't slow your writing down. I haven't had much time to read this past month. I have managed to read a few novellas in Highland Winds: Scrolls of Cridhe, Volume 1: Five Hundred Years of Scottish Romance. Enjoyable. Pat, doing my left hand in like I did meant I went back to doing first drafts longhand, the way I wrote before I was published. And I've found that suits me MUCH better - so perhaps it's an ill wind that ended up blowing good. After much ouching, I must say. Thanks for the congrats - so excited to have a new book on the shelves. The Scrolls of Cridhe - what a great title. Must check it out. I do love a Scottish romance! Hi Anna! I'm looking forward to reading A Scoundrel By Midnight! My most recent reads were ones I rediscovered while 'cleaning out' my kindle app. I rediscovered Diana Douglas's Once a Spy duo: The Bewitching Hour and The Devils Own Luck. Before that I read Grace Burrowes' The Duke's Disaster. Glad you are recovered from your injury! Glenda, I slipped in the kitchen and went down badly on the tiles - and seriously, the amount of trouble it's been, I may as well have fallen off Mount Rushmore! Thanks for the good wishes. Ooh, those books sound interesting. I'll have to check them out. Hope you enjoy my scoundrel! PJ and Andrea, it's been just like old times, hasn't it? Thanks so much for hosting me and giving me such a lovely spread on the blog - seriously that's a lot of real estate we covered in that interview and everything else! It's like one of my hero's estates! Happy May to everyone! And may all your moonlights be scoundrelly! The books I've read recently that I would recommend Crazy For the Cowboy( arc) by Vicki Lewis Thompson, The Smuggler and the Society Bride by Julia Justiss, Sliding Home by Kate Angell, A Perfect Distraction by Anna Sugden and The Marriage Charm by Linda Lael Miller. I go on streaks reading contemps then I'll switch to historicals. Your book sounds fabulous! 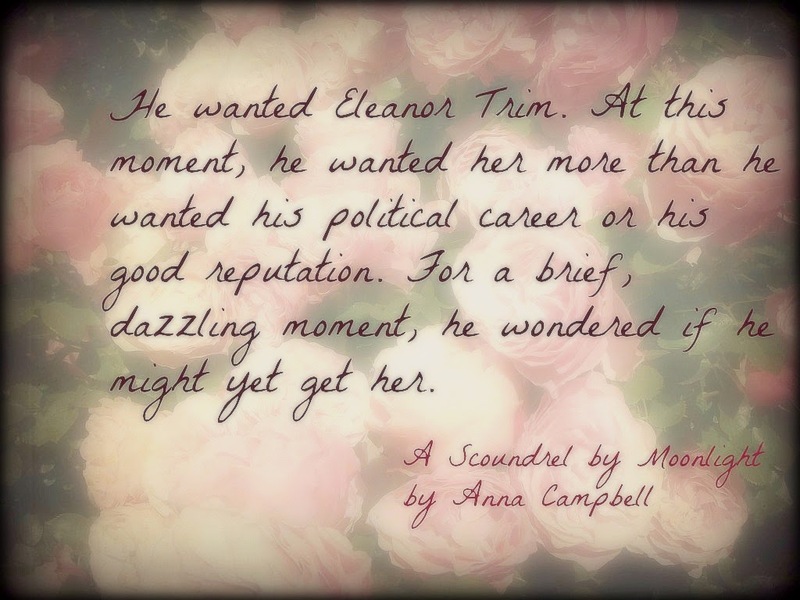 Congrats on the release of A Scoundrel A By Moonlight. Thanks so much for the good wishes for Scoundrel, Laurie! And what a great list - I'm already a huge fan of Anna Sugden's hockey books. Aren't they delicious?